This Kite Optics doublet loupe has two lens elements for extra sharp images with a magnification of 15x and lens diameter of 23mm. 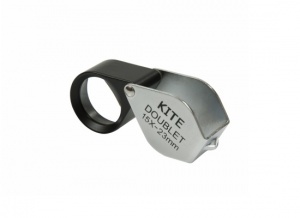 The durable aluminium case protects the loupe when not in use and it has an attachment point so that it can be used with a lanyard. Supplied with a leather storage case.